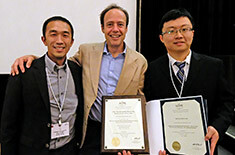 L-R: Dr. Kam K. Leang, Dr. Eric Seibel (UW, won 2017 Rudy Kalman Best Paper Award), Dejun Guo winner of 2017 ASME DSCC Student Best Paper Award. Photo taken at 2017 ASME DSCC, Tysons Corner, VA.
DARC Lab Ph.D. student, Dejun Guo (pictured on the right), advised by associate professor Kam K. Leang (pictured on the left), won the 2017 American Society of Mechanical Engineers (ASME) Dynamic Systems and Control Conference (DSCC) Best Student Paper Award, held October 11-13, 2017 in Tysons Corner, Virginia. This conference and competition represent the best of the brightest minds in the field. For reference, the other finalists were from Texas A&M University, Villanova University, MIT/Northeastern University, UC Berkley, and University of Texas at Dallas. Co-authored by Prof. Leang, Guo’s paper entitled, “Position and Linear Velocity Estimation for Position-Based Visual Servo Control of an Aerial Robot in GPS-Denied Environments,” presents theoretical and experimental results that exploit low-cost cameras for aerial robots to estimate 3D position and velocity information for vision-based closed-loop in areas without GPS signals. The innovative approach enables aerial robots to operate under autonomous control for applications such as search and rescue and emergency response in mountainous regions and indoors where GPS signals are poor or nonexistent. 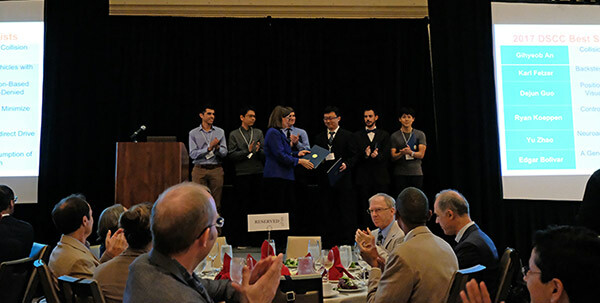 Dejun Guo presented with the 2017 ASME DSCC Best Student Paper Award, at the conference banquet. DSC Conference is the showcase technical forum of the ASME Dynamic Systems and Control Division. It provides a focused and intimate setting for dissemination and discussion of the state of the art in dynamic systems and control research, with a mechanical engineering focus. The 2017 DSC Conference Technical Program consisted of sessions in all of the usual areas of interest to the Division that include, but are not limited to, automotive and transportation systems, bio-systems and health care, energy systems, mechatronics, modeling, identification, intelligent systems, robotics, vibrations, and smart structures. 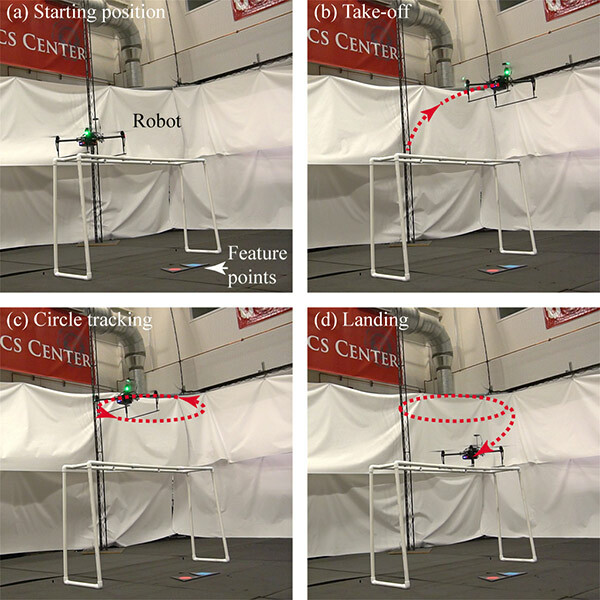 Figure from Dejun’s winning paper showing experimental results of an aerial robot (a) starting on a platform, (b) taking off, (c) tracking a circular trajectory, and finally (d) landing on the platform using visual-servo control. The two features points that the robot sees with its on-board camera and uses in the nonlinear observer are shown. Dejun Guo received the B.Eng. from Northwestern Polytechnical University, Xi’an, China, in 2012 and the M.S. degree in the Department of Automation, Shanghai Jiao Tong University, Shanghai, China in 2015. As previously mentioned, he is currently pursuing the Ph.D. degree in mechanical engineering from the University of Utah. His research focuses on control theory, visual-servo control, and precision mechatronics, with application in aerial robots and nanopositioning systems.